This contemporary art tapestry "White Gloves" shows the work of New York artist Richard Ely. His works include the series with multiple pieces named White Gloves and Black Gloves. His works are modern and suave and here we see a woman in distinctive white gloves in a semi illustrative style reminiscent of cartoons and manga comics. The woman's expression has an air of mystery. The colors in this piece, like all of Ely's works, are balanced yet has a modern edge to it, with the use of mauves, blues, purples and blood reds providing a nice contrast to the tans as well as small splashes of greens and cyans. 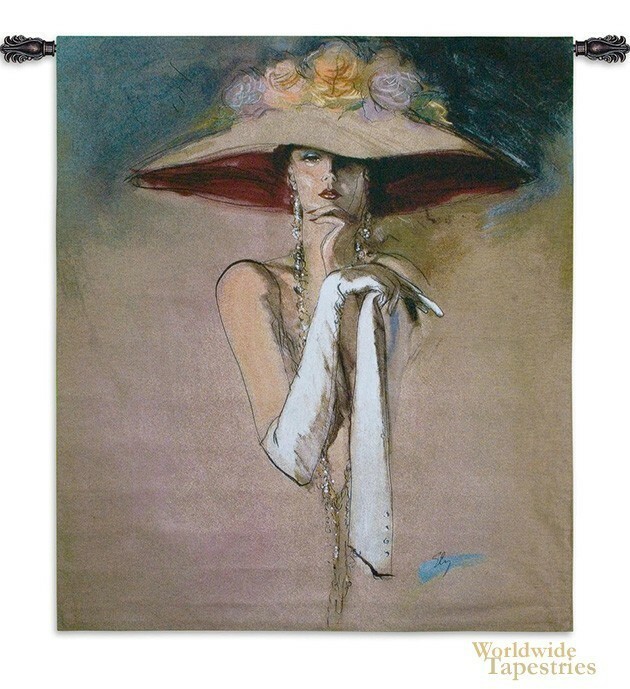 This art tapestry "White Gloves" is backed with a lining and has a tunnel for easy hanging. Note: tapestry rod and tassels, where pictured, are purchased separately. Dimensions: W 46" x H 53"